Most entrepreneur's are constantly looking to get their startup funded, starting from the very time of conception. The reality is that funding is just one part of a startup's life. Team, product, and execution are almost always more effective and powerful tools in a founder's arsenal than only throwing money at the problems your company working to solve. Let's say though, that for the sake of this post, you got your company off the ground and funded. You even attracted enough investors to raise a Series A, B, and C too. Nice work! Then, some time after that you even exited your company as well! Impressive, I think you have the hang of this startup thing. If you have ever wondered how startup funding works and what it would be like to go through the process of raising venture capital and angel investor money to fund your startup, well wonder no more. 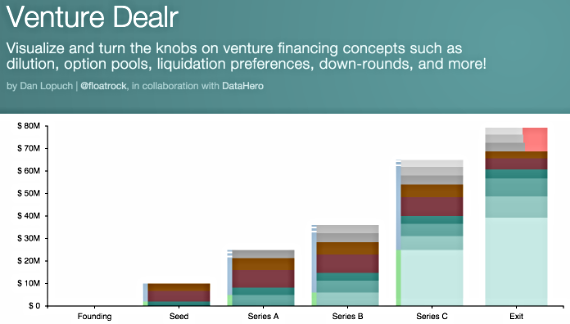 Dan Lopuch and the team at Data Hero have created the "Venture Dealr". A pretty sharp Github project that allows you to visualize and turn the knobs on venture financing concepts such as dilution, option pools, liquidation preferences, down-rounds, and more. So go ahead, take your startup and shoot for the moon by clicking the button below.